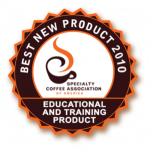 VST received the Best New Product award at the SCAA Exposition in Anaheim for MoJoToGo™ in the Education and Training Category. On display during the three day event, the largest of its kind in the U.S., both MoJoToGo™ and ExtractMoJo™ were being demonstrated by developer Vince Fedele at booth 2831. Mr. Fedele also gave a technical presentation on New Approaches to Brew Analysis at the Executive Symposium during the exposition. See the full list of SCAA Product Awards here.